Last week, several Turkish news sites published an article called “Washington Exploiting Christianity against Turkey” written by Adnan Cavusoglu. The author’s attention was drawn by the site christianpersecution.com, which covers the facts of Christian persecution all over the world. The site was launched by the Order of St. Andrew the Apostle, an Orthodox organization defending the rights of the Ecumenical Patriarchate of Constantinople. The Order members, Archons, are civilians who “have been honored for their outstanding service to the Orthodox Church.” Archons hold conferences, have meetings with various politicians and lobby bills on religious freedom. Cavusoglu claims that the only purpose of christianpersecution.com is to blacken Ankara’s image and that it is just a part of the Order’s information campaign against Turkey. Mostly, the pieces on the site are republished from other media with short remarks added. 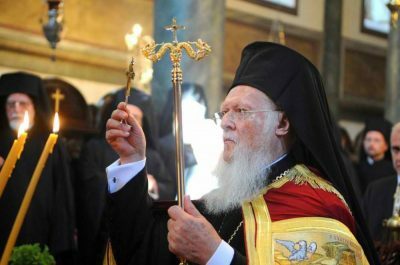 The posts are edited and approved by high ranked hierarchs of the Ecumenical Patriarchate, the author writes. According to Cavusoglu, one of the “editors” is Metropolitan Elpidophoros Lambriniadis of Bursa. In particular, the Al-Monitor article republished by christianpersecution.com on August 13, focused on the plight of Christians on the island of Heybeliada where the theological school headed by the Metropolitan is situated. The actual situation, however, differs from the one depicted on the website. The Order of St. Andrew carries out an anti-Turkish policy. That’s why the organization’s National Commander Anthony Limberakis is said to constantly slam Turkey and president Erdogan. The author also highlights the ties between the Order, the Greek American Archdiocese of the Ecumenical Patriarchate (GOArch) and the US Department of State. “One of the Archons is Michael Karloutsos, a top State Department official, son of an influential GOArch hierarch Alexander Karloutsos. It’s no wonder then why the site publishes articles criticizing Ankara,” Cavusoglu states. As noticed in the article, most posts of the website are about Pastor Andrew Brunson, who is under house arrest on terrorism and spying charges in Izmir. His detention became the pretext for Washington to impose sanctions against Turkey. So, christianpersecution.com seems to be another tool of the United States to attack Ankara, concludes the author. Gizem Akbash is currently taking up MA in International Relations at Cleveland State University.